1) How do balloons fly? Balloons operate through the basic principles of buoyancy and heat transfer. Buoyancy is a basic principal of physics that say a body is buoyed up (lifted up) by the difference in its weight and that of the medium it displaces. With ships or submarines the medium displaced is water with Hot Air balloon the medium displaced is cool air. 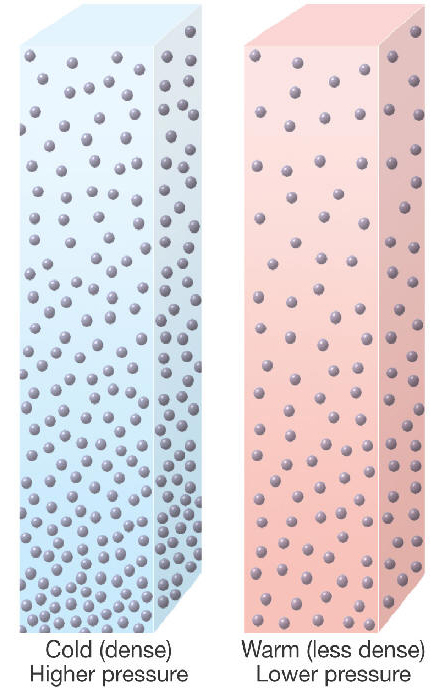 The differential comes from the fact that hot air at a given pressure weighs less than cool air; thus Hot air rises, and carries the balloon along with it. As the air inside the balloon cools, it descends. 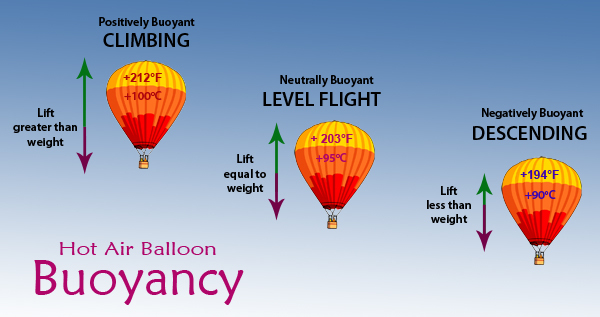 The temperature of neural buoyancy is dependent up on two things: The weight of the load, and the density of the air that the balloon is flying in. The heavier the load the hotter the balloon has to be to be neutrally buoyant. There are several factors that determine the air density: temperature, altitude, and humidity all play a role in determining air density. Given a fixed weight balloon, the less dense the air is the hotter the balloon needs to be to be neutrally buoyant. The hotter the air around the balloon the hotter the balloon must be, the higher the balloon the hotter the balloon must be, the moister the air the hotter the balloon must be to be neutrally buoyant. Winds determine a balloon's direction. balloonists can steer a balloon, to a limited extent, by adjusting the balloon's altitude to make use of different wind speeds and directions. Below is a chart of the winds aloft derived from doppler radar soundings. some general observations that hold true until you would really like to count on them: Generally surface winds are lighter. 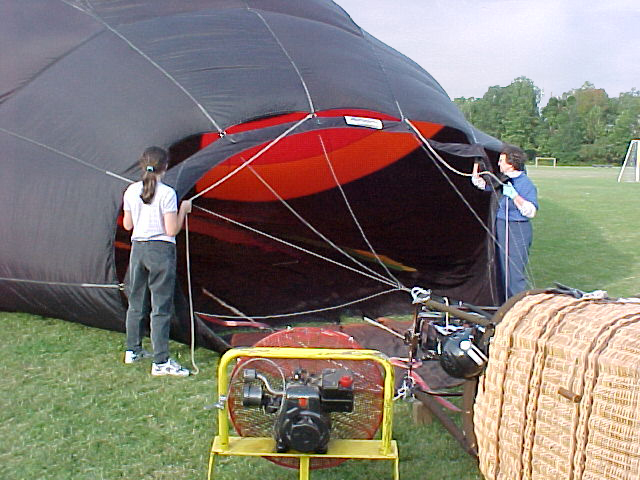 To make the balloon fly, an inflator fan fills it with air, which is then heated with a burner to give the balloon lift. 2) Can you steer a balloon? John 3:8 The wind blows where it wants to. You hear its sound, but you don't know where it comes from or where it is going. Experienced balloonists can sometimes be very accurate in guessing the winds path, only later to be humbled by its complexity. The chart on the right shows Radar (Velocity Azimuth Display) winds for a typical balloon flight. These winds change minute to to minute. But this resource can be used to help guess what the winds aloft will be doing. 3) How long does a balloon flight last? The actual flight time with Sky Sail Balloons averages about an hour. The entire ballooning experience, including pre-flight preparation, flight and post-flight celebration, may take two to three hours. 4) How long could a hot-air Balloon stay in the air? Flight duration is determined predominantly by three variables. The proportional load in the basket (number of people relative to fully-loaded capacity), air temperature, and the amount of fuel carried. Balloons that fly in the summer with fully loaded baskets can typically fly about one and a half hours. Conversely, a lightly loaded balloon flying in the winter may be able to fly six to eight hours on the same fuel volume. The reason winter flying is more efficient is that cold air is more dense, and a given temperature differential between the air in the balloon and the outside air produces more lift. The reason passenger loading impacts efficiency is that the more people you have in the basket, the hotter you have to heat the air in the balloon in order to fly. Maintaining this temperature differential requires more fuel. 5) What fuel do balloons use? Sport hot air balloons carry 20 to 45 gallons of propane in stainless steel fuel tanks. Propane is generally readily available. It is liquid in its stored state (which results in dense energy storage) and it does not require a fuel pump or pressurization under most circumstances and its Moderate vapor pressure allows storage in reasonably lightweight tanks. Butane has too low a vapor pressure and would have to be pressurized. 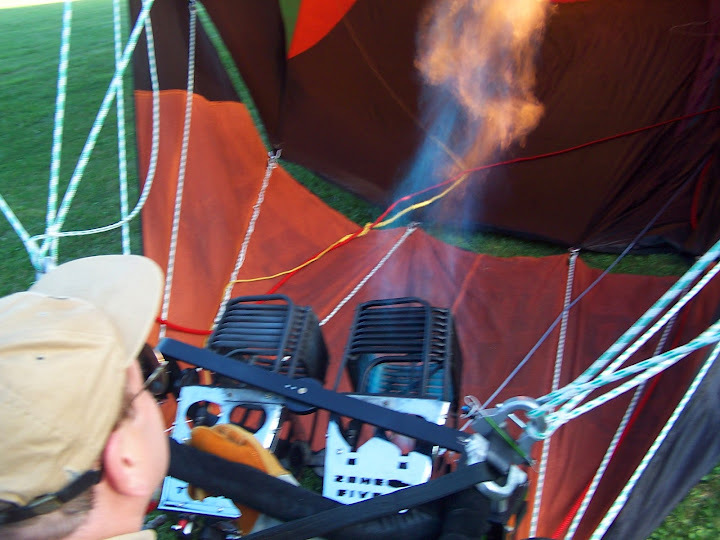 Butane, though not ideal fuel, is used in ballooning in some countries where propane is not commercially available. Compressed natural gas would need very large and heavy tanks it can’t practically be stored in its liquid state for transportation in a balloon. 7) How much heat do burners produce? Each burner canister in a State of the Art Balloon System is capable of producing in excess of 18 million BTU of heat per hour. This is the equivalent of 600 average gas grills and many balloons have two burners. You can literally feel the punch of hot air as it hits the top of the envelope particularly if the basket is not fully loaded. 8) How much fabric is in a balloon? The amount of fabric in a balloon is obviously dependant on the size of the balloon a typical four passenger balloon has over two thousand square yards of fabric. 9) How come balloons have different fabric configurations that come down to the balloon Basket? The fabric that extends from where the support cables attach to the balloon down to the baskets is called a skirt. Although the configurations vary from balloon to balloon, the basic purpose is the same. The skirt minimizes the effects of minor wind sheer on the flame of the burners. Balloons that are frequently used for tethering or that can be turned with rotation vents often have nonsymmetric skirts called scoops or dippers. These channel air into the balloon to maintain pressure in moderate wind conditions. 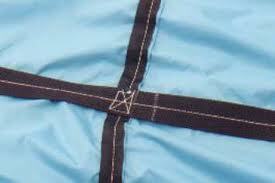 10) What is the narrow seat belt material that is at most of the vertical and horizontal seams of a Hot Air Balloon? This webbing is the strength of the balloon. Although fabric alone could be used to make a balloon, the design factor would be very low and balloons might be threatened by occasional high stresses that balloons are exposed to. With the webbing the balloon in more than ten times stronger. 11) Why do balloons fly in the early morning and late evening? Winds are generally most favorable the first hours after sunrise and the last hours before sunset. 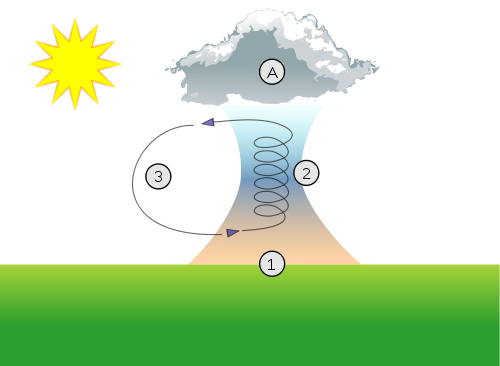 The sun's uneven heating of the earth's surface causes strong, variable winds. In the morning, it takes a few hours for the sun to heat the earth's surface enough to generate the thermal activity that creates wind. In the evening, the sun's intensity has diminished enough to reduce winds to acceptable flight levels. Ideal winds are 3 to 6 mph. 12) Why do some flights get canceled? Ballooning is the most weather-restricted form of aviation. Typically, there must be no thunderstorms in a 100-mile radius, winds must be under 10 mph, and must be predicted to stay below 10 mph throughout the remainder of the flight, and there must be no precipitation in the vicinity. Additionally, wind direction, available launch and landing sites, fog, or low ceilings can be reasons for balloon flight cancellation. 13) How high do balloons fly? 14) What makes the ideal landing field? First and foremost, is welcoming landowners, willing to allow a balloon to land. If it is a mowed field in close proximity to a road, this is ideal. A landing balloonist must also consider the proximity of power lines, creeks or ponds, livestock, and crops. 15) Who can be a balloonist? 16) Do you need a pilot's license? 17) How can I be involved without buying a balloon or becoming a pilot? Many people start in ballooning as a crew person. In most areas, you can join a local club such as The Genesee Valley Balloon Association or The North East Ohio Balloon Pilots Association that organize races and community functions. You can also join the Balloon Federation of America, which is the national sanctioning body for the National Championships and is dedicated to promotion of the sport. In addition, you can check the local yellow pages for balloonists in your area and offer your services. Or, the next time you see a balloon flying in your area, follow it and offer to help when it lands. 18) What are balloons made of? Balloons include several parts: the envelope (the fabric portion of the balloon), the basket, burners and fuel systems. The material for balloon envelopes is made of ripstop nylon or ripstop polyester with tough, silicone or urethane coatings for heat and air retention. Most baskets are made of wicker or rattan, which is strong, yet flexible and is aesthetically pleasing. Burners can come in either single, dual, or triple. They are made of thermal resistant stainless steel. The burners vaporize the liquid fuel much like a rocket engine, the difference being that balloon burners operate at lower pressures and use ambient air for their source of oxygen to sustain combustion. 19) How much does a balloon cost? Like cars and boats, new balloons can vary in size and amenities. You can start with a smaller sport model for around $14,000. These balloons typically carry a pilot and maybe one additional person. The larger balloons that can carry two or ten passengers in addition to the pilot will range between $15,000 and $100,000. There are many good used balloons on the market that vary in price due to size, age and flight hours. 20) Besides a Balloon what else do you need to go Flying? A “chase vehicle is required to transport all but the tiniest balloons, Balloons travel with the wind and can cover considerable distance depending on wind speed and flight duration. A gas powered fan is required to cold inflate the envelope. Toy balloons and a helium tank are required unless you always fly with other pilots who have them. Pibals (pilot balloons) are critical for pre-flight studying the winds aloft. A quality hand held compass to read Pibals is important. If you really want to be accurate a stopwatch, and an inclinometer, will allow you to determine the exact wind speed, and direction, at specific altitudes. Helmets are a good Idea and are required equipment for some manufactures. Gloves to minimize the transfer of skin oils during envelope handling and to prevent rope burn from handling lines are a good idea. Pilot gloves that have long cuffs and offer protection from open flame and raw liquid propane frost burns are smarter still. A Tie down line that has a simple reliable release under considerable tension, yet can restrain a balloon with the equivalent of over 5000 square feet of sail area, is a must. It’s a good Idea to have an aviation Radio particularly if you fly in the vicinity of an airport. Some airspace is only accessible with a radio. Ground communication between balloon and chase, including radios and cell phones are suggested both from a safety prospective and a “where are you” prospective. Some Balloonist invest in tether systems, which allow a balloon to be flown up and down while tied to the ground. The maximum height and wind tolerance of these systems vary considerably. As does the associated price. If a pilot desires to fly in the winter, special equipment (tank heaters or nitrogen fuel pressurization) is required to insure adequate fuel pressure. Depending on where you fly a two wheel cart in the chase vehicle might be the difference between having willing crew, and crew who need to wash their hair when it’s flyable. At Sky Sail Balloons we employ electric four wheel cart, the ultimate crew assist device. One other accessory that is nearly universally hated by crew but is sometimes a necessary evil is a tarp to lay out the envelope on. Dusty, damp, muddy or snowy landing fields can really take there toll on balloon fabric. Crew preference also may dictate having an envelope “squeezer” to milk the air out of the envelope after flying. There are any number of other contrivances to help minimize labor and keep things orderly. 21) How safe is ballooning? Even if you participated in all of our flights, you would have a greater risk of being injured at home or in your car. Bad Pilots, either pilots who think they can handle anything or low skilled pilots who have not developed the skills necessary to handle routine flying tasks, or pilots who fly too infrequently to stay sharp. Bad Weather, wind, wind shear, turbulence, thermals, instability, precipitation. Bad Equipment, equipment that is either not maintained or inspected consistent with the manufacturers’ recommendation. Power lines, and antennas, and ground obstacles. Nothing in life is without risk, but balloon operations that avoid these threats, are nearly flawless, in their safety record. 22) What does Sky Sail Balloons do to mitigate potential accident risks? Our primary pilot is Geoff Turner flying since 1989. He was trained by world renowned pilots in the North East and in Albuquerque NM in an FAA certified FAR part 141 flight school. With decades of practical experience, he is fully qualified. He attends a minimum of 5 but frequently 8 – 12 classroom hours of recurrent safety training annually. Biennially he undergoes a proficiency review where familiarity with the Federal Air Regulations, emergency procedures, including simulated emergencies, and practical flight proficiency is assessed. He carries a commercial balloon pilot certification issued by the (FAA) Federal Aviation Administration. Despite his proficiency, and because of his decades of experience, he occasionally opts for staying on the ground, when marginal flight parameters exist, always intending to err on the side of safety. Current weather information, availability and accuracy, are light years ahead of where they were in 1989 when Sky Sail Balloons started. Both the pilot and the crew are familiar with what weather circumstances present a threat to ballooning. Geoff reviews all pertinent weather parameters prior to the flight and the ground crew monitor developments during the flight. Geoff is an amateur meteorologist and has been the weather officer for many balloon festivals. Other balloon pilots look to Geoff to assist in making sound decision as to whether or not to fly, although rapidly developing weather events or unanticipated weather threats can still develop during the course of the flight. Our Pilot is a firm believer in then saying. It is better to be on the ground wishing to be in the air, than on in the air wishing to be on the ground. Sky Sail Balloons Inc equipment is manufactured according to standards for safety that are approved by the FAA. Our aircraft are at least annually inspected, in accordance with guidelines set forth by the manufacture and approved by the FAA. All work is either conducted by or overseen by a FAA Certified repair station. We comply with the same procedures that apply with all federally registered standard aircraft. Our aircraft thusly carry a valid standard current airworthiness certificate. Sky Sail only uses inspection and repair stations that have been trained by the manufacturer specifically for our make and model aircraft. Geoff Turner personally oversees all inspection processes, and or repairs, or part replacements. This is not required by the FAA but insures that all recommended processes are completed consistent with the manufactures recommendation. Because balloons rarely take off and land at established airports. They do not use established approach and departure corridors, that have power lines and antennas clearly marked; Because if this, and because balloons can not be steered left or right to avoid such obstacles, extra care must be taken to see and avoid them. It is particularly hard it visualize obscure obstacles just after sunrise and just before sunset when balloons fly to avoid higher daytime winds and thermals. Particularly when viewing against and dark background from the air. The job of spotting for wires is an easy one to involve all hands, or should we say all eyes. The pilot calls to the crew of verify wire placement when it is not apparent from the air. The bottom line is that Sky Sail Balloons has never had a flight that has resulted in serious injury, or necessitated a serious equipment repair. Even if you flew every flight with us, you would have a greater likely likelihood of being injured in your car, or in your home, then flying with us. In the final analysis when you are riding in balloon, you have over 6,000 square feet of sail area, on a vehicle with controls that can only make it go up or down, and only do that controllably with favorable weather conditions. Ballooning is an adventure sport with a not insignificant risk. Like so much in life, the greatest reward comes from activities the involve a little risk. Website designed by Blue Dock Media™.